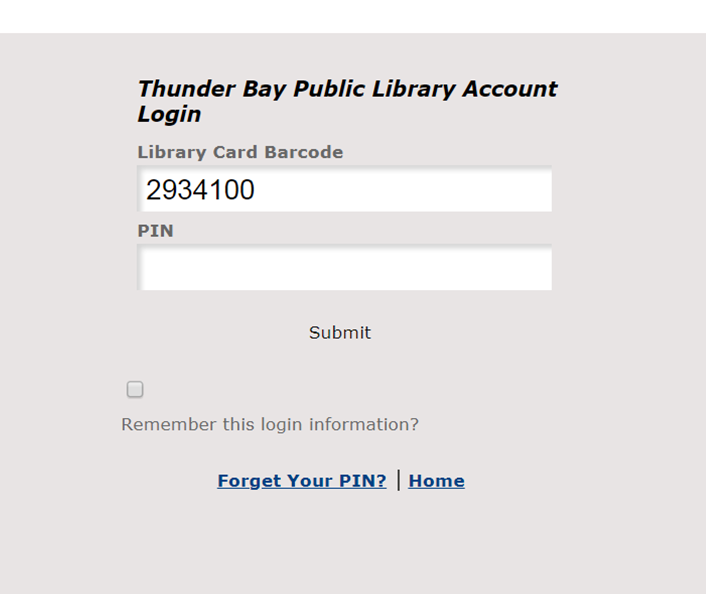 Visit search.tbpl.ca and click on Login to access your Library account. 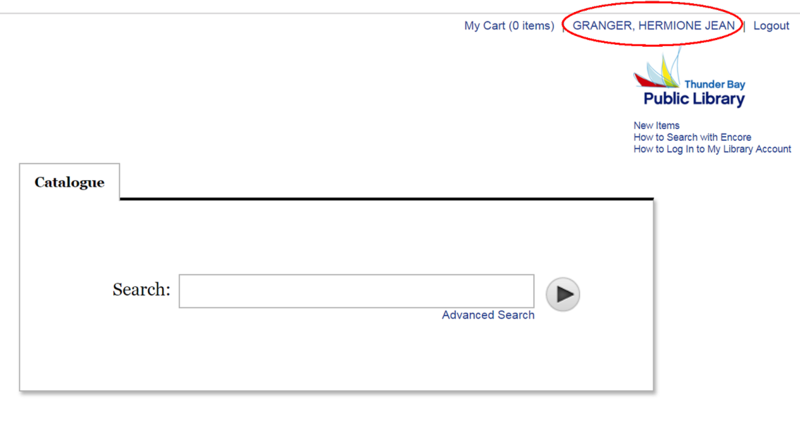 You can also log in by choosing the My Card icon on the upper righthand corner of any Library page. 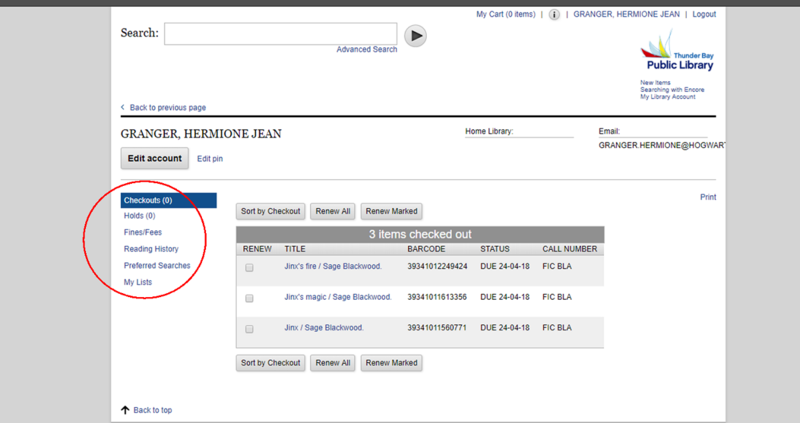 Just like with the Classic Catalogue, you will log in using your Library barcode and PIN. You can choose to save your barcode on this form by clicking the "Remember this login information" box. 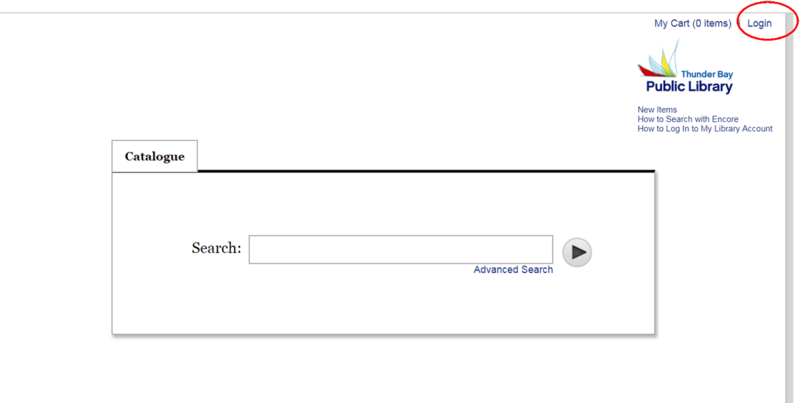 After logging in, your name will appear at the top of the Search page. To view your account, click on your name (found in the top right corner where you clicked to Login). Your account will list any items you have currently checked out, along with their due dates and renewal status. To view your Holds, pay Fines/Fees, view your Reading History or Preferred Searches, and to view your Lists, simply click on the appropriate heading. To renew, check the Renew box beside the item title, or click on Renew All to renew all items currently checked out. After making your selection, click on Renew Marked and you be asked to confirm your choice. After the renewal has been completed, a new due date will appear beside the item along with its RENEWED status. To view the details of your fines or to pay them online, click on the Fines/Fees heading. The following page will include full circulation details for the items that incurred fines, including the original checkout and due date and the total amount owing. You can then click on Pay Online to pay off your fines using Mastercard or Visa, or visit us in the Library to pay in person using cash, debit or credit card. Click on the Hold heading for a complete list of your holds with full details, including their status and when the hold was placed. To cancel a hold, just click on the box beside the title and check Confirm. To cancel all holds, just click on the Cancel All button. Placing Holds - Request It! 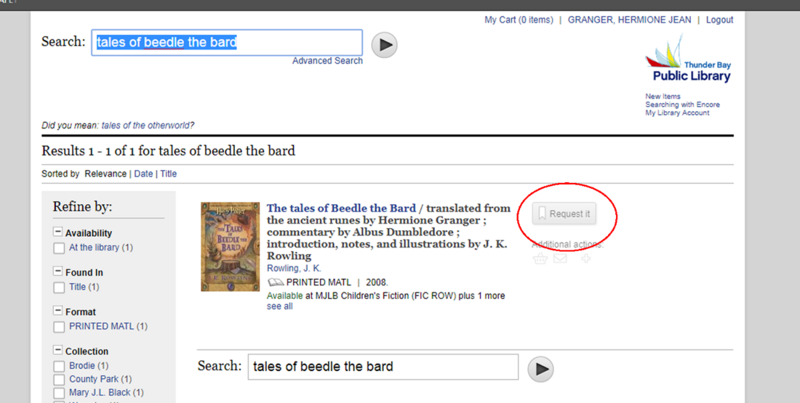 After finding the item you want, click on the Request It box. A window will appear asking you to choose a branch for pickup. Click Submit, and you will see a confirmation message that your hold as been placed. Want to learn more about searching with Encore? Click here! Click here to learn more about Searching with Encore!